I have added another handy tool to the Construction Plus Toolbar. This tool allows the user to successively select a group or component instance and get its overall dimensions (bounding box dimensions). The tool had no icon. You had to access the Tool menu to select it. The script was not implemented as a Tool class which means you could only use it once and then had to select it again. The dimensions were provided in an annoying message box which the user had to close each time. The tool didn’t provide the definition name of the selected group or component instance. These missing or annoying features have all been implemented or fixed in this tool. 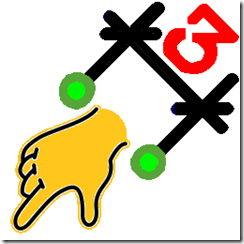 The tool icons and tool cursor have the image shown above right. The picture at left shows how this tool is used. Click on image to enlarge it and see the details. Notice that after selecting the Back Leg component instance that the tool remains active and will continue to remain active until another tool is selected. So you can examine a number of groups or component instances successively. The reported Thickness will always be the smallest dimension. Width the next smallest dimension and Length the largest dimension. In some designs the Length is shorter than the width for grain direction purposes. Visually check your bounding box to see if it reflects your intended axis orientation. If not, use the Change Axis tool to correct it. An error message will appear if you select an entity that is not a group or component instance. However, no such message will appear if you click in white space, that is, if you click on no entity at all. Download construction_plus.zip and save it in a folder of your choice; in Windows 7 that is usually the user’s Downloads folder. Using WinZip unzip the file, select all files and folders and Extract them to your Plugins folder. When you have completed the extraction described in the previous paragraph your Plugins folder should have five new folders and six new files as shown in blue highlighted folder and files in the picture at right. Upon opening SketchUp you will need to go to menu View/Toolbars and enable Construction Plus (not to be confused with Construction). 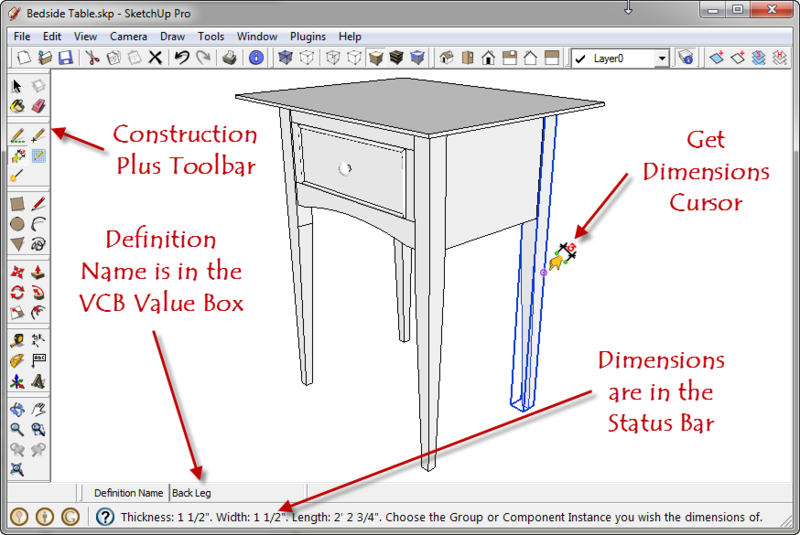 This will display the Construction Plus toolbar on your desktop which you can position in the usual way. Enjoy! And please report all problems to jpz@srww.com. A student wrote me asking how he could make a SketchUp model that realistically represented a project he built in the shop. The project is a lampshade constructed of four L shaped risers and horizontal stretchers. 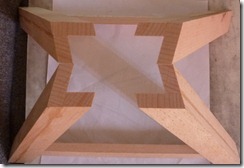 In the shop he started with four risers, each glued up to produce the L shape. He tied two sets of the risers together with a stretcher. The results are in the picture at left. The student didn’t share his thoughts behind his question with me, so what follows is my interpretation of what he may have been thinking. He may have wondered why the left and right sides of the L were not 90° to the sides. Being curious he may then have produced a SketchUp model, perhaps to answer his question. The SketchUp model produced desirable results as seen below right. Clearly all the side are right angles. He wondered why the difference and asked if I could produce a model that represented “reality” – i.e. the shop version. The simple answer as to why these models are different is that he built the shop model and the SketchUp model differently. The shop model started with glue ups at right angles and roughly 1” on a side and 3/8” thick. 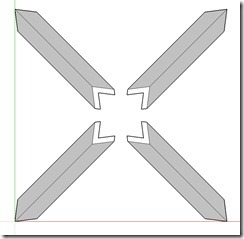 He then made a compound cut to allow the risers to tilt inward in both the x and y direction. The problem is that when you tilt the risers in both direction and then tie them together with a stretcher, which itself is tilted inward, you force the other side to point inward. Further, when you cut the L shape with a compound angle you produce a cross section that is not rectangular, but rather parallelogram in shape. You can see this nicely in the photo thanks to the glue lines. 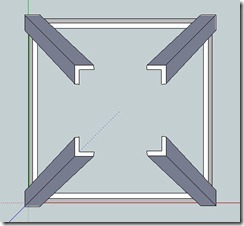 Click on the photo to enlarge it and look at the pieces joined together to form the L.
So why did the SketchUp model look so nice and provide the desirable results? The answer is found in a quote from the email he sent me. 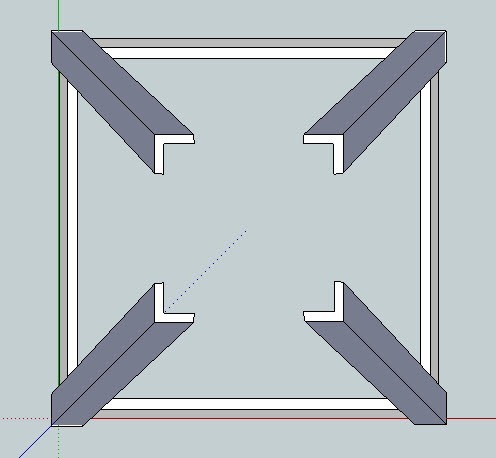 SketchUp Model: To make the vertical risers – drew the bottom (L-shape) as a horizontal plane, drew a second "L" and moved it up and out, and then connected the corners. He essentially made the assumption that a compound cut would produce a cross section with right angles, that is, rectangular in shape. He then produced the cross section he wanted and copied it at a higher elevation and shifted it inward in both x and y direction. Finally he connected the corresponding corners to form risers. 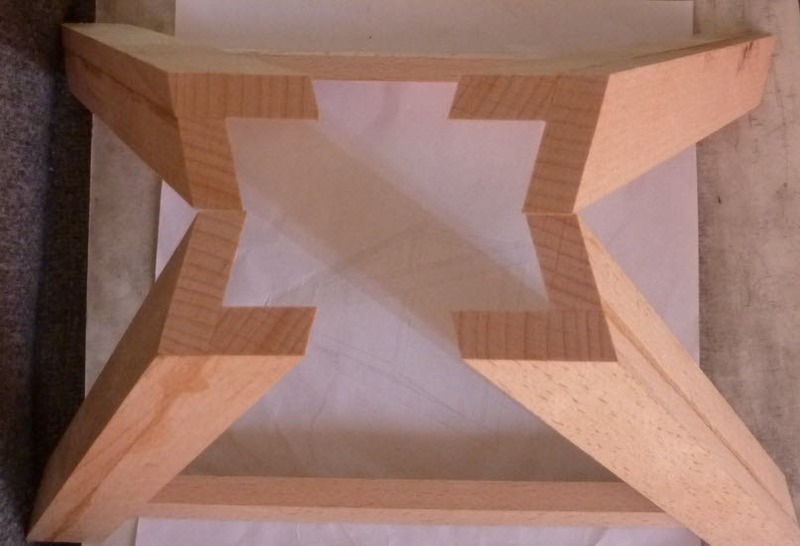 A detailed inspection of the resulting riser would reveal that the angle between the outside faces would have to be greater than 90°; not by much. In fact little enough to deceive the eye. I constructed a riser using this right angle assumption just as the student did. It was 1” wide on the outside faces, 20” high and tilted in 3” in x and y. The angle between the outside faces I measured to be approximately 91.3°. I then constructed a SketchUp model using the shop model approach. That is, I started out with L shaped risers that was all right angles. Then I used slicing planes to cut the top and bottom just as you would do with a compound miter saw. Then I rotated the risers in the x and y direction to align the compound cuts with the ground plane (red/green plane) and achieved the desired tilt. The resulting picture is at left. This model is tilted a lot to demonstrate what happens. The only reason this model does not look exactly like the shop picture above is because I did not tie riser sets together with stretchers and force the front and back faces to align. If I had the side faces would be angled in even more. You can download this model and convince yourself that the risers are in fact constructed from right angle stock and compound mitered at the ends. 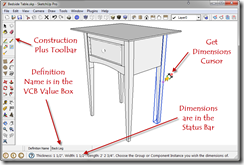 Compound miters, or more generally, faces that are at angles to two planes, are a difficult problem for most people starting out with SketchUp to master. 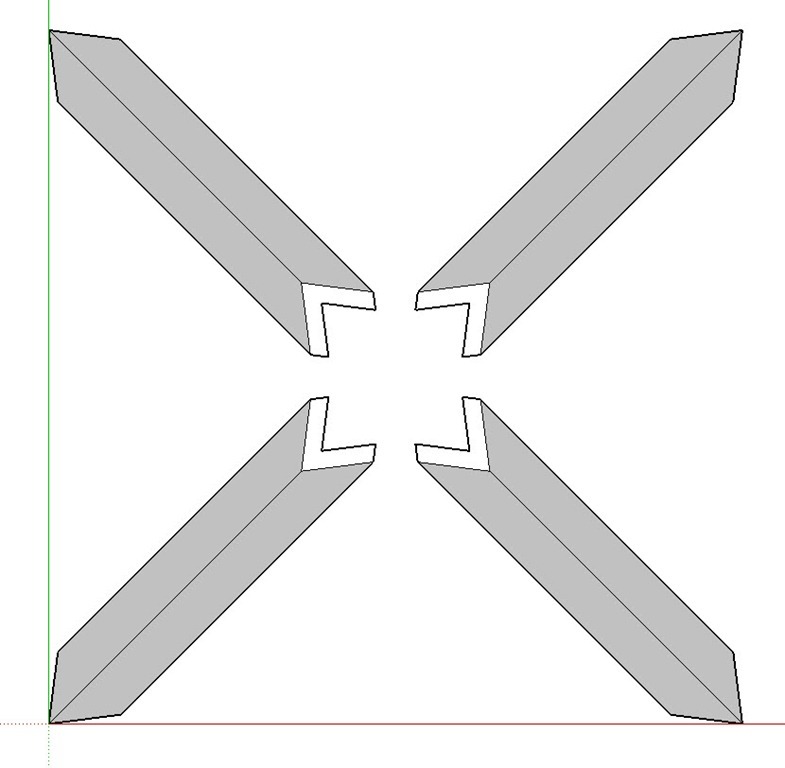 If you have taken my beginner’s and intermediate SketchUp courses you have heard me talk about slicing planes. This problem begs two questions: how do you create the correct compound slicing plane to achieve the desired splay and what angles do you set your table saw, or compound miter saw for when cutting them. I will answer the first question in the attached video below. The second question is the subject of a subsequent post. Stay tuned. Drawing Tapered & Splayed Legs is a related tutorial video you may also be interested in. You can view Drawing Compound Miter Faces In SketchUp by pressing the play icon below or by downloading it to your system. The video file is mp4. It can be viewed with most video players including QuickTime and Media Player. If you have a default, or user specified, file association for .mp4 you may have to delete it or use a download manager to download this file. Otherwise the associated application may be invoked and file streaming will prevail over downloading. There are numerous free download managers on the internet. Be careful, and do some research to locate one that is not loaded with spyware or viruses. You may find it easier to view the video in full screen mode. Start the video before selecting this mode. To enter full screen mode click the little screen icon at the bottom of the video player. When in full screen view hold your cursor near the bottom of the screen to access the video player’s controls. Exit full screen mode with the Esc key. Sit back, relax and enjoy the show!